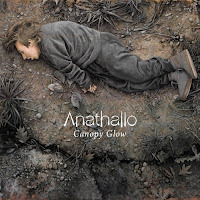 If you like Stereolab but wish their music had a little more structure than Anathallo's new release Canopy Glow is for you. Just as Stereolab features a large lineup of multi-instrumentalists Anathallo consists of musicians playing guitars, non-traditional percussion, flugelhorn, autoharp, trombone and much more. The vocal combination of Matt Joynt and Erica Froman gives the music a nice indie taste. The instrumentation is creative but still structured enough to sing to. If your impression is similar to mine listening to Canopy Glow is equivalent to finding a diamond in the rough. With a week that included Nickelback and Wu Tang Clan, Anathallo is our saving grace. Thanks for checking out ClapTrapped music. I'm going to bookmark your blog and read it often. I hope you check back with our blog and let us know what you think. hey yeah it is a great album, been playing it non-stop for a while now. Reading your blog reviews - nice ani difranco review - ive been a bit put off since the brilliant 'to the teeth'(in my opinion haha) so ill pick it up. Would love to exchange links.